I feel fairly burnt out, too. I know how you feel Magpie. We'll be out back drinking mojitos on the deck when you're ready to swing on back by! Fantastic! I mean the fundraising. You, we'll miss, until you're back in the swim. Meanwhile, I feel ya - and I'm tickled by the new pre-posting-schedule thingy, too. I wrote a week's worth for next week when I'll not only be out of town, but without the Internet. Talk about roughing it!! We'll see how this works. Meanwhile, rest up and we'll see ya around. I think burnout is fairly common in Blogopolis, especially when school lets out, summer hits, and chaos reigns. 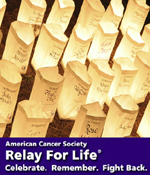 Here's one for you...a very nice lady just tried to sell me a luminary for the relay here in our community. I said, "OK here's $5 but keep the luminary, cancer hasn't touched my family (yet)" and then when I turned around it hit me and I realized I have a severe brain defect. My mom just fought and won her bought with colon cancer 2 years ago and about 5 months ago my father-in-law died from brain, lung and etc cancer. How nuts is that? Relay on, sister! I so know that burnt out feeling. And here I thought I was the only one with a little black heart. Take care of yourself--all three of you. your sis have a golden heart! Now I've got the Bishop Allen song "Little Black Ache" in my head. Take care of yourself and ignore us as long as necessary. If work won't give you a sabbatical, blogging surely can.